It's been a very nice pullback we've had over the last few days, and one that I really wasn't expecting to start until we got a little higher first. Now it's setting up a very obvious head and shoulders pattern, which from my experience fails 50% of the time. And that leads me to think we are going to run hard to the upside when this thing turns back up, and that should be today at some point. That suggests tomorrow we'll see a squeeze on the bears looking to short the top of the right shoulder, which might just morph into a run to 2800 or more to make the pattern fail and squeeze out the shorts again. No doubt it's going to be tricky here as what is obvious to most will likely fail to play out. I'm not even sure yet that we are going to turn back up today? We could keep on dropping to that 2600 area into tomorrow and screw up the entire pattern I've been tracking for weeks now. In fact it's already veering off path quite a bit and unless we turn up today and rally hard into Monday the pattern could be a total miss. Right now we are one day off from that pattern I've been tracking but we need to turn back up hard and top out on Monday for it to stay on track. 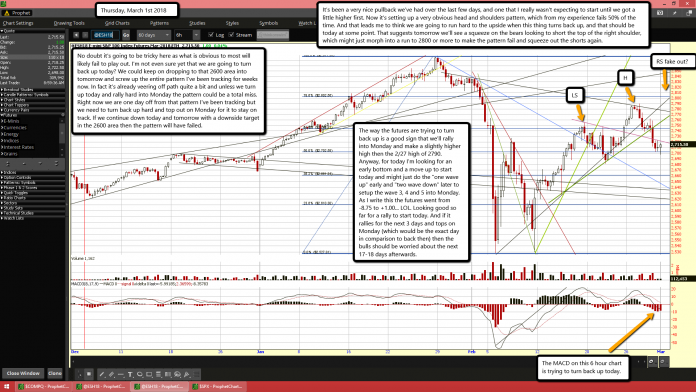 If we continue down today and tomorrow with a downside target in the 2600 area then the pattern will have failed. The way the futures are trying to turn back up is a good sign that we'll rally into Monday and make a slightly higher high then the 2/27 high of 2790. Anyway, for today I'm looking for an early bottom and a move up to start today and might just do the "one wave up" early and "two wave down" later to setup the wave 3, 4 and 5 into Monday. As I write this the futures went from -8.75 to +1.00... LOL. Looking good so far for a rally to start today. And if it rallies for the next 3 days and tops on Monday (which would be the exact day in comparison to back then) then the bulls should be worried about the next 17-18 days afterwards. Next articleHouse passes bill to “microchip citizens with “mental disabilities”..who’s next?